"Shadow" redirects here. For the Smasher, see Smasher:Shadow. Official artwork of Shadow the Hedgehog for Team Sonic Racing. Shadow the Hedgehog (シャドウ・ザ・ヘッジホッグ, Shadow the Hedgehog) is a character from the Sonic the Hedgehog series who, like Knuckles the Echidna, is a rival of Sonic the Hedgehog. He is a hedgehog known as the "Ultimate Lifeform." He has his own game that mainly features him, the self-titled Shadow the Hedgehog, which was released in 2005 for three out of the four major sixth-generation consoles (the lone exception being the Sega Dreamcast, which was discontinued before Shadow the Hedgehog was planned). Since his debut, he consistently holds second place as the most popular character in the franchise, trailing the eponymous character. Unlike his heroic counterpart, Shadow is a much darker and developed character, willing to do whatever it takes to reach his goals. However, in recent games, he has become a somewhat lighter, anti-hero character. In Smash 4, Shadow is also voiced by a different voice actor in the PAL versions (depending on the region), similar to Sonic. Shadow performing Chaos Control in Sonic Adventure 2: Battle. Shadow the Hedgehog first appeared in Sonic Adventure 2 as one of the main antagonists, but towards the end as a protagonist, and has appeared in numerous Sonic games since. He is Sonic's arch-rival, but they have become allies on few occasions mainly due to Shadow's role as more of an anti-hero with inherently good intentions after his character has been more deeply explored. In Sonic Adventure 2, Chaos Control was used as a form of teleportation that makes Shadow move through space at an incredible speed (or in other forms of media, the power to warp time and space in general to even use other Chaos-based powers). In two-player mode, Chaos Control stopped time and "froze" the opponent while Shadow moved at normal speed. Chaos Control was also used to slow down time in Sonic Heroes and when fighting against a boss in Shadow the Hedgehog. Chaos Control is one of the Chaos powers Shadow naturally inherits but when he is within the proximity of a Chaos Emerald, the power is amplified. In the Super Smash Bros. series, Shadow appears as an Assist Trophy and uses Chaos Control to slow down time for opponents, but not for the character who summoned him. Shadow using Chaos Control in Brawl. Shadow appears as an unlockable Assist Trophy character in Brawl and uses his Chaos Control ability to slow down everyone except the summoner (similar to the effects of the Timer item, though with a shorter duration, and without the risk of it backfiring). Shadow the Hedgehog is unlocked when the player unlocks Sonic as a playable character. He also appears as a regular Trophy and a sticker. In Brawl, Shadow the Hedgehog is voiced by Jason Griffith (who also voices Sonic) in the English version of the game since his own game and since the anime Sonic X, and Kōji Yusa in the Japanese version. The Shadow trophy in Brawl. 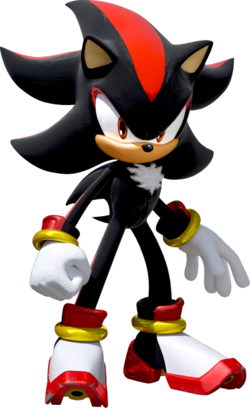 Shadow The Hedgehog is a black hedgehog who resembles Sonic. He was created by Dr. Eggman's grandfather, Gerald Robotnik, to be the ultimate life-form. Not only does he look like Sonic, but he has equal abilities. He has great skill with the space-time warping technique called Chaos Control. To reach his goals, he'll use any means necessary. 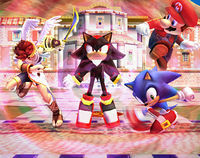 Shadow as an Assist Trophy in Super Smash Bros. for Wii U.
Sonic and Shadow together in SSB4. Shadow retains his role as an Assist Trophy that slows down time in SSB4. His distortions are more visually apparent in this game, appearing clearly in the foreground. His own visual aesthetics were also altered to be just as bright as in his home series, as well as his mouth's placement being more to the side of his muzzle instead of right below his nose. This time, he is voiced in English by Kirk Thorton, who succeeded Jason Griffith in voicing him in the Sonic series since 2010 with Sonic Free Riders; Kōji Yusa reprises his role in Japanese and just like Sonic, Shadow has gained voices in other languages as well. The Shadow Trophy in the Wii U version. The Shadow Trophy in the 3DS version. Engineered to be the ultimate life-form by the brilliant Professor Gerald Robotnik, this black hedgehog appears very much like Sonic. He has a dark side, however. In Smash Bros., he uses Chaos Control to warp space-time, slowing every fighter down except the player who summoned him. A black hedgehog created by Professor Gerald Robotnik to be the Ultimate Lifeform. Though he looks a lot like Sonic, he's ruthless and will do anything to achieve his goals. In this game, he uses Chaos Control to warp time and space, slowing down everything around whoever summoned him. Shadow the Hedgehog performing Chaos Control in Super Smash Bros. Ultimate. Shadow returns as an Assist Trophy and now holds a green Chaos Emerald. As in Brawl and SSB4, Shadow performs Chaos Control to slow down the opponents of the fighter that summoned him; however, in this game there is a brief second phase that completely stops the opponents. His visual distortion is green and is much more apparent with lightning also striking around him. Shadow also appears as a primary spirit. He is classed as an Ace, attack-based spirit with 2 support slots. His enhanced version is Super Shadow, a Legend, attack-based spirit with 2 support slots. Super Shadow's effect is Undamaged Attack and Speed. Official artwork of Shadow from Brawl. Sonic and Shadow standing back to back on Final Destination. Shadow's pose after performing Chaos Control in Ultimate. Shadow's spirit description shown when Masahiro Sakurai detailed Spirits mode in Super Smash Bros. Ultimate at the Nintendo Live 2018 Tokyo Convention. Shadow's trophy in Super Smash Bros. Brawl incorrectly states his first appearance as Sonic Heroes when he first appeared in Sonic Adventure 2. Despite his trophy and official artwork sharing the same pose in Brawl, the mouths on the trophy and artwork are in different positions. Even on a fast moving stage such as Delfino Plaza or Rumble Falls when sped up, Shadow's effect will not stop even when he goes off the stage. Shadow's trophy pose in Brawl resembles his artwork for Sonic the Hedgehog (2006). Additionally, his trophy pose in SSB4 resembles his artwork for Sonic Rivals. Shadow is the only Assist Trophy to have his voice actor change from Brawl to SSB4. Shadow is the only Assist Trophy to appear in an intro movie, with his cameo in the intro of Super Smash Bros. for Wii U. Though Riki also appears, he is only present as part of Shulk's Final Smash, Chain Attack. This page was last edited on April 1, 2019, at 22:47.